Web home pages are very much in fashion now, and here is mine. Mostly I use it as a link page to things that interest me and if you have come looking for Contract Bridge, or items on Birkenhead it's here. I hope you might then try some of the other links here - just for fun. 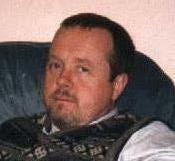 I live have moved from Cavendish Road, and now live up the hill in Chetwynd Road, still in Birkenhead, UK. I'll keep links to the famous early Victorian 226 acre Birkenhead Park for sentimental reason and because people access these. The town itself lies toward the tip of the Wirral Peninsula - separated from the city of Liverpool by the Mersey estuary and from North Wales by the rather wider Dee estuary. It is easy to get lost coming here - use this map to help you. Try out ParadoX advances when your partner has indicated an ambiguous long suit. Some musical links This site has been quiet for a while - but I'd invite you to visit a discussion of the musical modes on a diatonic melodeon: dorian, phrygian, lydian, mixolydian, aeolian and locrian. Much of music is based on these and the page explains why the chords differ so much for 'minor' keys. Basically they aren't the same minor! 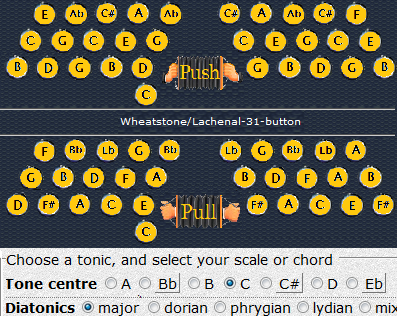 I've also made a web based generic scale and chord finder that should find the buttons you are after on any squeezebox, be that melodeon, button accordion or concertina. You can set it up to simulate your own instrument - and it's free.